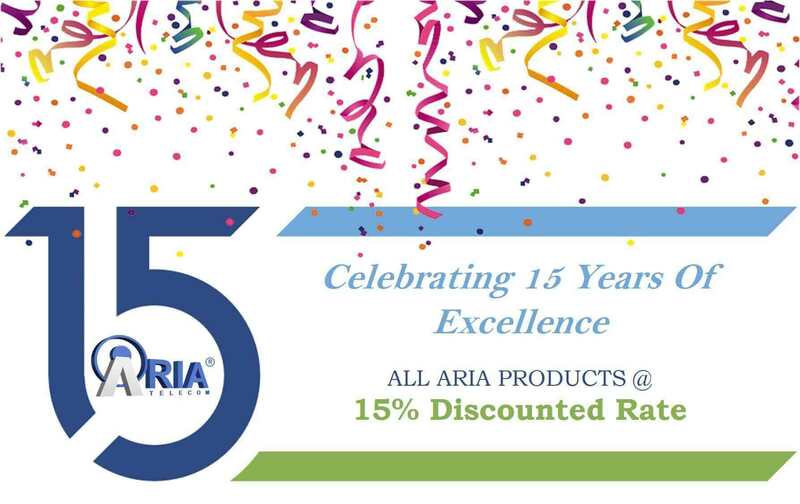 Today, Aria Telecom has completed 15 years of the glorious journey towards excellence and service accuracy. In last 15 years, it has worked hard to achieve success in various telecom service domains among Indian business industry sector. Now, Aria Telecom has become a well-known name among industry players as the best provider of office and business telecom services. In this occasion, Founder Mr. Ravindra Saini has said “It’s because of my team who have worked day and night for our dream to be the big”. He also thanked all the employees and stakeholders of Aria Telecom Solutions for being together since inception during both happy and hard times. Further he has remarked that, Aria Telecom has roll out exclusive 15 percent discount on all products. The offer will be valid on all software, hardware and cloud based products till the anniversary week. In the last 15 years, the company has worked with a number of big giants from many industries including aviation, real estate, electricity, health and many more. Since inception, the company, Mr. Founder and every employee has worked to make Aria a great name among customer base. Today’s big day is the result of all their hard work and efforts that has helped the organization to reach so far. Founder Mr. Ravindra Saini has further added “we now offer over 50 telecom service products in out different lines and planning to add more in upcoming future. We have entered the cloud and app-based communication technology this year with the help of our hard-working team. We have also planned for introducing new features in our product lines in the upcoming year which will revolutionize the industry standard.